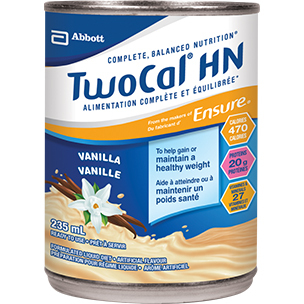 TwoCal® HN is a nutritionally complete, high-calorie formula designed to meet the needs of people with increased protein and calorie requirements and for people requiring low-volume feedings. For people with elevated energy and protein requirements. For people requiring low-volume feedings. For people with fluid restrictions. For supplemental or as a sole source of nutrition. Expiration date on end of can. Shake well and clean top of can thoroughly before opening. Once opened, store covered in refrigerator and use within 48 hours. Serving TwoCal® HN chilled enhances its flavour. Care should be taken to avoid contamination of this product during preparation and administration. Use under medical supervision. For enteral use only. Not for IV use. NOTE: Failure to follow the INSTRUCTIONS FOR USE increases the potential for microbial contamination and may reduce hangtime. Pump feeding is recommended; use an 8 Fr or larger tube. Gravity feeding is not recommended. Turn container upside down and SHAKE VIGOROUSLY, using a twisting motion, for at least 10 seconds. DO NOT touch any part of container or feeding set that comes in contact with the formula. Visually inspect for signs of leakage. DO NOT use if leakage is apparent. When initiating feeding, follow health care professional's instructions. Adjust flow rate and volume according to patient’s condition and tolerance. Calorically dense, with 2 Cal/mL. 20 g protein/235-mL can (83.5 g protein/L). Contains 1.97 g/235-mL can and 5.0 g/L of short-chain fructooligosaccharides (scFOS). 1. Jukkola K, McLennan P. Improving the efficacy of nutritional supplementation in the hospitalized elderly. Austr J Ageing 2005;24:119-24. 2. Kerrigan ER et al. Dispensing of a calorically dense oral supplement with medication pass: a creative approach to oral supplementation. J Am Diet Assoc 1996;96(Suppl):A32. † Fructooligosaccharides (FOS) have been listed as an accepted source of dietary fibre by Health Canada in April 2013. Labels will be revised accordingly as part of Abbott Nutrition’s ongoing label review. dl-α-tocopheryl acetate, manganese sulphate, niacinamide, calcium d-pantothenate, cupric sulphate, pyridoxine hydrochloride, vitamin A palmitate, thiamine hydrochloride, riboflavin, chromium chloride, sodium molybdate, folic acid, sodium selenate, potassium iodide, phylloquinone, biotin, vitamin D3, cyanocobalamin. Contains: Milk, soy. Not suitable for individuals with galactosemia. CONTAINS: Priority food allergens: Milk, soy. Ingredients associated with food intolerances and/or sensitivities: Corn, coconut oil, citric acid, artificial flavour, lactose, other soy components. TwoCal® HN, Vanilla, Ready-to-hang container: Water, corn syrup solids, sodium and calcium caseinates, corn maltodextrin, high oleic safflower oil, sucrose, medium chain triglycerides (modified coconut oil and/or palm kernel oil), canola oil, fructooligosaccharides (FOS), potassium citrate, magnesium chloride, calcium phosphate, natural and artificial flavours, soy lecithin, sodium citrate, ascorbic acid, choline chloride, taurine, L-carnitine, zinc sulphate, ferrous sulphate, dl-α-tocopheryl acetate, niacinamide, d-calcium pantothenate, manganese sulphate, cupric sulphate, thiamine chloride hydrochloride, pyridoxine hydrochloride, riboflavin, vitamin A palmitate, folic acid, biotin, chromium chloride, sodium molybdate, potassium iodide, sodium selenate, phylloquinone, cyanocobalamin, vitamin D3. Contains: Milk and soy ingredients. Gluten-free; not suitable for individuals with galactosemia. CONTAINS: Priority food allergens: Milk, soy. Ingredients associated with food intolerances and/or sensitivities: Corn, coconut oil, citric acid, natural and artificial flavours, lactose, other soy components.